Zoton FasTab is a dis-solvable tablet used to reduce heartburn and combat other symptoms associated with acid reflux. This medication contains an ingredient which is able to reduce the amount of stomach acid the body produces. Available in two strengths, these tablets are a fast acting medication which are easy to take as they can be either swallowed whole or dissolved on the tongue depending on your preference. Have you had any of the following tests within the past 12 months? Have you been prescribed treatment for heartburn by your GP or a specialist before? Have you had heartburn symptoms for more than a month without seeing your doctor? 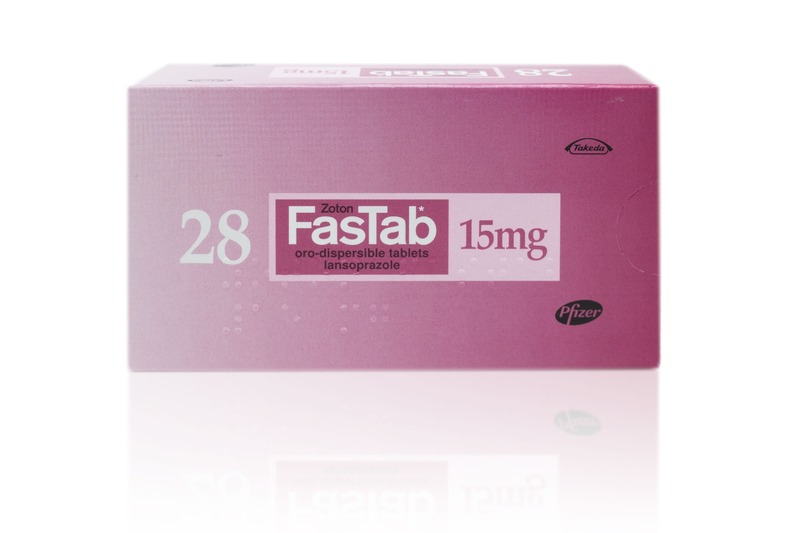 Zoton FasTab is a medication used to treat heartburn and other symptoms which can occur as part of gastro-oesophageal reflux disease (GORD), also known as acid reflux disease. The tablets are able to reduce the levels of stomach acid in the body, which not only lessens GORD symptoms but also decreases the risk of getting stomach ulcers. Zoton FasTab is available as dis-solvable orodispersible tablets in two strengths and is made by Pfizer. Zoton tablets contain an active ingredient called lansoprazole, which is classed as a proton pump inhibitor. This means that the ingredient is able to interfere with the function of proton pumps, which are located in the stomach and crucial in producing stomach acid. By reducing the activity of the pumps, less stomach acid is produced and this helps to ease heartburn and other symptoms associated with acid reflux. How is Zoton FasTab taken? There is more than one way that you can take Zoton tablets when prescribed them. They can either be swallowed whole with a glass of water, or a tablet can be placed on the tongue and then sucked gently as it rapidly dissolves in the mouth. When opting for the latter method, the tablet will release micro-granules which should be swallowed whole without chewing. How many days Zoton FasTab is taken for (and how many tablets in a single day) can vary depending on what exact symptoms are being treated. When dealing with heartburn and acid regurgitation, usually one 15mg or 30mg tablet is taken every day for four weeks. Your doctor should be contacted with symptoms are not relieved after four weeks. You also should not stop taking this medication earlier than you’re meant to even if your symptoms get better. Your condition may not have fully healed at the time and issues may reoccur before finishing your treatment course. For those who have trouble with swallowing, this medication can be administered via syringe. Other potential side effects are much less likely to crop up but can cause a lot of trouble and distress. You should talk to your doctor or pharmacist as soon as you can if you do experience side effects while taking Zoton. Can I use Zoton FasTab?